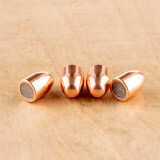 Make yourself some great .45 ACP practice ammo with these full metal jacket (FMJ) projectiles from Zero Bullets. These FMJ bullets measure .451 inches in diameter and can also be used to load .45 Super, .45 GAP, and .460 Rowland calibers. 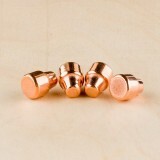 Projectiles from Zero Bullets are made in Alabama and feature true copper jackets to withstand high velocities. 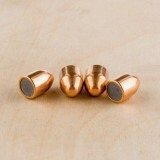 These bullets weigh 230 grains which fits the many of the most popular and most traditional .45 ACP load data. Love these bullets. Great quality bullets for a great price! No issue reloading and shooting them. Hornady is my absolute favorite bullet to use but Zero is becoming a very close second!!! 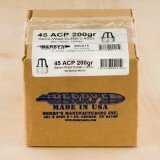 If you need affordable bullets for punching paper, Berry's bullets are for you. Each projectile in this box of 500 is a Semi Wad Cutter (SWC), has a .452" diameter, and weights 200 Grains. 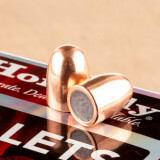 Berry's bullets are made with swaged lead cores that are plated to their final weight, then each projectile is re-struck to ensure the final product is very consistent. 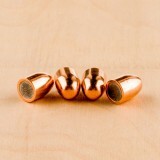 Copper plated projectiles are more affordable than jacketed bullets and will not foul your barrel like traditional cast lead. 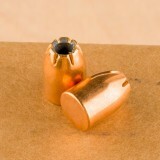 Build some high velocity self-defense cartridges with these jacketed hollow-point (JHP) projectiles from Zero Bullets. 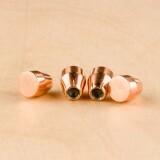 These bullets measure .451 inches in diameter and can be used for .45 ACP, .460 Rowland, .45 Super, and .45 GAP. The 185 grain projectiles are on the light end for all of those calibers and allow a hand-loader to experiment with lower-recoiling load recipes for practice or high velocity loads for increased penetration in a personal defense or hunting role. 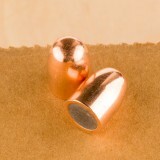 These JHP projectiles have light segmentation where the copper jacket meets the hollow cavity which helps ensure wound-causing expansion at a wide range of impact velocities. Zero Bullets, an Alabama based company, has a great reputation from selling at gun shows all across the Southern United States and is praised for offering inexpensive, high quality projectiles. Don't forget to check out Widener's great selection of pistol powders for crafting the perfect load. No failures through 250 rounds. Just as accurate as HAP, cleaner than lead. 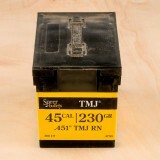 Excellent, very accurate bullet, comparable to Noslers, but cheaper. 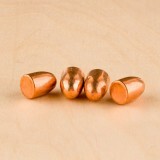 Roll your own .45 ACP self-defense loads with these jacketed hollow-point (JHP) projectiles from Zero Bullets. 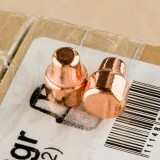 These bullets projectiles are copper jacketed to resist high speeds and have a diameter of .451 inches which can be used for .45 ACP, .460 Rowland, .45 GAP, and .45 Super recipes. 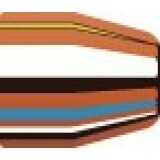 The hollow cavity with light segmentation at the tip of the bullet will cause it to expand on impact for a larger wound cavity and greater terminal performance. 230 grains is a standard weight for the caliber and will match a wide range of proven load data. Zero Bullets is an Alabama-based manufacturer that has been making rounds in the gun show circuit for years and has a great reputation among hand-loaders for quality projectiles at a low price. Excellent bullet at a superb price point! This is an excellent bullet at a superb price point! 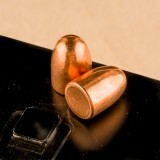 I use them in my Kimber Gold Match2 (stainless) with great results seated over a variety of powders! Also use them in my 50 cal T/C Impact muzzleloader with various 50/45 sabots, loaded over Blackhorn 209 propellant and yielding 1800+ f-sec velocity with 11/4" groups @50 yds! Been using these for years now. The consistency has always been great! Never had any issues with these. The 185-grain bullet has no exposed lead, which helps with smooth feeding, ensuring a jam doesn’t cost you a match. The swaged core enhances balance and external performance, while the hollow point delivers terminal ballistics that meet your high standards. 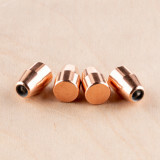 With these .451-diameter bullets, you’ll be all set for a full day at the range. If you shoot the .45 Automatic Colt Pistol (ACP) round, you understand the need for an affordable yet effective cartridge. 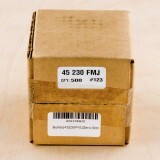 Make sure you are reloading your spent cases with high-quality bullets by ordering this 1,900-count box. 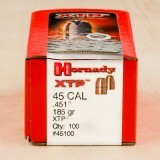 You’ll get powerful and accurate ammunition that uses Hornady’s HAP design, which is intended for competition shooting. 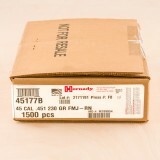 Hornady is known for innovation and performance. This company was founded in 1949 with the goal of creating superior ammunition for varmint, big game, and target shooting. Through advanced research and design, they have become one of the most popular brand for many different purposes. 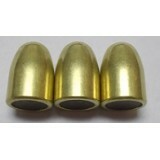 I have purchased a couple cases each of these HAP bullets in 9mm, 45 and 40 caliber. They perform well accuracy wise, I’m getting ¾-1” groups at 25yds out of a Sig P220 and a Wiley Clapp 1911 Government, both with Barsto barrels. I would caution that the jackets are thin or soft as I reloaded some Federal primed brass that had bullet sealant and it caused the cone to deform on the 40 caliber bullets. 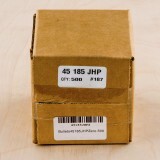 You can load your empty .45 ACP cartridges with high-quality full metal jacket bullets by ordering this 1,500-count box from Hornady. 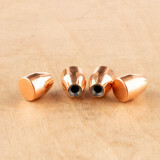 These bullets are excellent for use at the gun range, especially in auto-loading handguns, as they provide smooth feeding in the chamber and less fouling in the barrel. 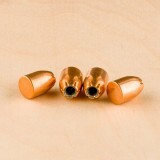 With these .451-diameter bullets, your .45 ACP cartridges will be ready for a full day at the range. 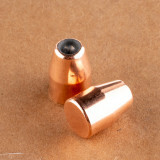 These bullets use a full metal jacket with a round nose and enclosed base design. This increases the smooth feeding and ensures a jam doesn’t ruin your target practice or, even worse, a competition match. The swaged lead core increases balance in these 230-grain bullets, giving you greater accuracy and tighter grouping. Hornady is a leading choice for many gun owners across the country. With advanced products for competition shooting and hunting, Hornady ammunition is a common sight in the fields and target ranges of America. 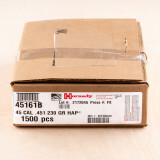 With this box of Hornady bullets, you’ll get 1,500 HAP (Hornady Action Pistol) 45 ACP bullets that are perfect for competition shooting and training. They have a swaged core, which give the projectile better balance, and a copper jacket that results in less fouling in the barrel. 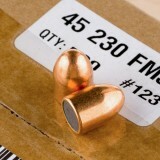 These 230-grain bullets have everything you need for accurate and effective marksmanship. 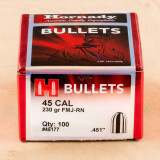 Hornady has been a top ammunition company since the early 1940’s. They were founded by Joyce Hornady, whose desire for a more accurate bullet pushed him to create innovative designs for rifle cartridges. Delivering outstanding speed and superior firepower, the .45 ACP (for Automatic Colt Pistol) has been a leading cartridge for law enforcement and self defense since it was first released in 1904. Many gun owners go through hundreds or even thousands of .45 ACP rounds in a single trip to the gun range, so the need for affordable, consistent ammunition is high. I have loaded and shot 10s of thousands of the Hornady HAP 45 bullets using Dillon RL550B and Dillon Super 1050 reloaders and I have never had a single HAP bullet deform!! 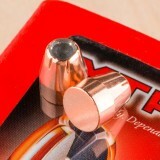 The HAP bullets chamber and cycle as the XTP in the same weight and the POI is virtually identical to the XTP! The quality and consistency that the HAP bullet provides make it perfect for competition shoots where accuracy and consistency count! The HAP is a jacketed truncated cone bullet that is tough enough for hunting where one needs a solid to drive deep through tough hide and bone! They punch through barriers material and auto glass like a laser! If your are deforming these bullets when seating them or in the crimp stage your reloading process and dies are FUBARed and you need to correct your errors and use the correct dies! I normally load XTP's but I got some of these for training. The lead is so soft that the nose deforms when seating into a properly expanded case, but only if I didn't try to taper crimp it with the seating die. Trying that squashed the bullet to the point it looked more like a donut than a bullet. I had to switch to a Lee factory crimp but most of the bullets still ended up deformed at the tip. I checked and the same setup did not deform XTPs in the least. In three decades of reloading I've never seen bullets this soft. 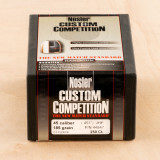 You can load your empty .45 ACP cartridges with high-quality jacketed hollow point bullets when you choose this 250-count box from Nosler. These 185-grain projectiles are perfect for competition shooting, delivering effective accuracy and power to the target while ensuring smooth, seamless cycling in the barrel. 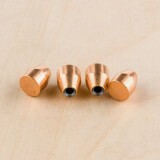 With these .451-inch diameter bullets, you’ll be all set for a full day of competition marksmanship. 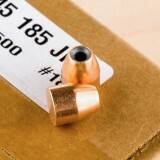 These .451" bullets for sale use innovative engineering from front to back. They start with a small hollow point tip at the front that delivers superior expansion without overly disrupting accuracy. In the middle, they have a custom-quality jacket covering a form-fitting lead-alloy core for maximum stability and balance. Finally, you have a pronounced boat tail, which increases flight characteristics. From front to back, these are the effective, reliable bullets you have been looking for. 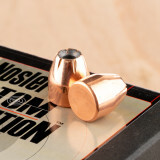 Nosler has been serving American gun owners with innovative bullets just like these since 1948.